When I consider various life threatening or life taking occurrences around the world, whether it be natural disasters or personally dreadful events, I am touched at how it often leads many of us affected, to want to embrace life, love, God…etc. more diligently. It causes the deepest offenses of our hearts to fade away and leads us to reach out to those we’ve disconnected with. We begin to see how truly small and insignificant were the moments of anger and bitterness that we’ve held a deep grip to, sometimes for a very long time. Our minds grasp a realization of how impermanent not only are we, but are those around us. But as time continues, we tend to forget the desperation and sobriety that clings to the unveiled frailty of life. We become once again comfortable in the probability of being the exception in death’s rule book. Careless are our days. Bitterness finds its way back into our hearts and distance regains its wedge between us and our God. Tragedy comes in many sizes; it is often on a relatively small scale, but many times wide-spread. No matter the range, there is always a lesson to be learned. When confronted with devastation, we face reality at the foundation of asking ourselves, “Right now, what really matters?” Things that we hold in high importance are usually what we seek after or have regret about in our time of grief-hence, the rekindling or deepening of relationships with God and others. With life, which is ever changing and situations that never stay the same, it is hard to keep the same fervor and intensity concerning things that are important to us. We should try to remember the things that will matter most to us at the end of the day and use that awareness to guide us in how we deal with our day to day situations and relationships. The next time we are faced with a challenge or difficulty, may we weigh out its true worth in our lives and allot adequate time and energy to it, then move on. May we hug our loved ones, extend grace to our enemies and complete the God-given tasks that we’ve been given. The harsh reality is, we will not always have the time to get things “right”. Death does not always send a heads-up notification. Tragedy is often a reminder that death is not too far and that it respects no one. We will all one day have to give a response to death and eventually, “Not right now” won’t cut it. In no way am I suggesting that we should we live in a bubble or in fear of things to come. I propose we try our best to live in love and appreciation of what matters most in life, which will cause the fear of death to lose its looming power. Should-have, could-have and would-have will all be dissolved at their roots, because opportunities will have been seized, indiscretions forgiven and love generously given. As continued sojourners in Life’s journey, it is my hope that we can sustain our focus and give all that we have to give. What good is storing up love or an apology for a tomorrow that is never promised? No matter how short or long we live, we will all leave our stamp here on earth, but how deep and staining the impression- is usually up to us. So, be diligent in giving your all and not assuming that another time will come or for tragedy to reveal an already available opportunity. Very thoughtful blog. It allows you to put your actions in your everyday life into perspective. Keep the blogs coming! Thank you for the feedback and encouragement! I will try my best, Miss Natlee. This was a very enlightening post, that allowed me to ponder on things I need to reconciliate with people before it’s too late. Thank you for expanding my thoughts, and challenging me to do better. Then my mission is accomplished! Thank you J’neal for your feedback! Please keep coming! This post reminds me of what goes through my mind after I hear that someone has passed away. However, I tend to cast these thoughts aside and jump back into the life I feel will last forever. 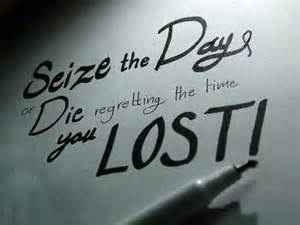 I too must seize the day and take advantage of every moment. Heaven and earth shall pass away but God will always remain. Thanks!! !